Brighten your stay in The Sunshine State by booking a room at Courtyard Orlando International Drive/Convention Center. Situated in the heart of the city and right off of International Drive, our hotel is just 1 mile from the Orange County Convention Center and minutes from Orlando's renowned theme parks, making us the perfect choice for mixing business with family fun. Prepare for a productive or exciting day in the sun with a breakfast sandwich and your favorite Starbucks beverage at The Bistro, then return in the evening for a variety of mouthwatering meals and cocktails. Following a memorable day, cool off with a refreshing dip in our outdoor pool, get in a workout at our state-of-the-art fitness center, or simply kick back and relax on our outdoor patio. When it's time to unwind, retreat to the soothing comforts of our stylish guest rooms and suites, complete with luxurious bedding, complimentary Wi-Fi, flexible work desks and plenty of space to spread out. Book your stay in The City Beautiful today! 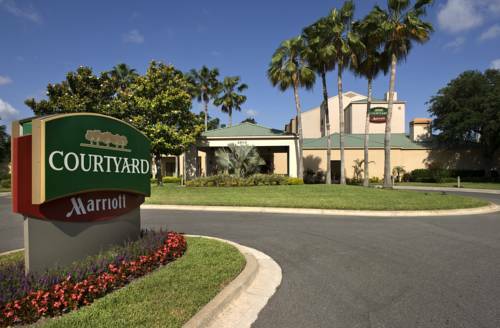 Our Courtyard hotel on International Drive is your food and beverage destination. Visit The Bistro - Eat. Drink. Connect. for a wide variety of breakfast and dinner choices. We've also got Starbucks beverages and evening cocktails.